In this video, we will be learning how to solve inequalities using multiplication or division. The rules are very similar to solving regular equations except for one rule. If we multiply or divide by a negative number, we have to flip inequality. To solve for , we have to divide both sides by . Since we divide it by a negative number, the inequality sign should be flipped. So, we’ll solve by dividing both sides by . Here, its negative divided by positive. Remember the rule? If we multiply or divide by a negative number, we have to flip inequality. In this example, we are dividing by positive . So there’s no need to flip the sign. To solve for , let’s divide both sides by . Here, we multiplied by a negative number so we have to flip the inequality sign. So in solving inequalities using multiplication or division, follow the same rules to solve for . 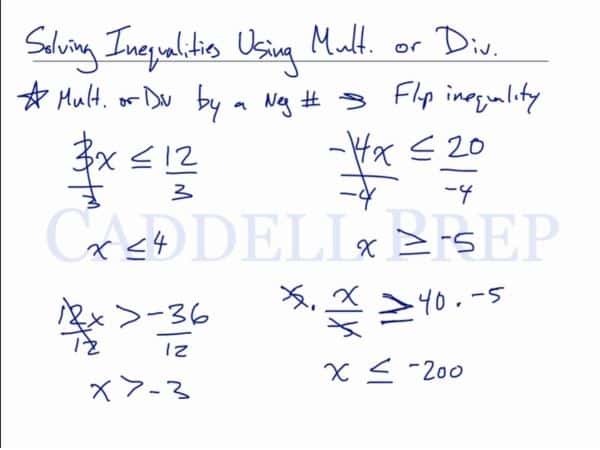 But if we, at any point, multiply or divide by a negative number, we have to flip the inequality sign.